Bad hair and don't care enough to scrub up day but at least I manage a smile. This cardigan took exactly forever to make. Well, it seemed like that when I was still working on it. I started back in June 2018 and finished at the end of January 2019. The endless rows of purling were just not my thing. It didn't help that this yarn needs knitting up with size 3.25 needles to obtain the correct gage. A further aggravating factor was the large size needed to cover my substantial frame. I seem to no longer have a waistline! The pattern is the Hatteras cardigan, which I found on Ravelry. I thought the construction was rather intriguing, knitted from top down and resulting in a bias hem. The rib is knitted entirely in the round, which pleased me no end. I also like the no closure front because I never button up a cardigan anyway. The instructions are clear and easy to follow. My top tip would be not to question the instructions and just trust them. I couldn't imagine initially how this thing would ever turn into a wearable cardigan! I used Drops Alpaca yarn for this cardigan. I am not entirely sure how many balls I used, maybe eight or nine? I bought it in the sales about five years ago, it cost less than two pounds per ball. I like this yarn but garments tend to grow a bit in length over time and the shape is maybe not as defined as it might be with a different yarn. It is a very soft yarn and the smell is distinctly alpaca (minus manure and bad alpaca breath notes of course). I rather like it. When knitted up, it always looks a bit uneven, which pains me because I pride myself in regular stitches. Experience with other garments I made with this yarn reassures me that after a few washes, this "perfect" look is achieved. I am not quite there yet, the sleeve stitches and the rib are still a bit higgledy-piggledy. All in all I am pleased with this cardigan. I don't wear purple much but I am quickly getting used to it. The top photograph is the best representation of the true colour, it is difficult to capture accurately. I have another bag full of soft pink Drops Alpaca. I don't really wear pink much either but I was seduced by the rock bottom price. I think I'll double up the yarn and make a warm simple raglan jumper, maybe with a cable down the middle front and back. This jumper comes to mind. What do you think? On a different topic, the temperatures are back to normal West of Scotland January averages (without checking the actual data) but it is rather windy. Our weekend was pleasant enough. The boys and I went to see "How to train a dragon: the hidden world". We all loved it. The original books series, TV shows and all three films are really fun. Plenty of strong women, always a bonus. I hope you had a good weekend, too. You scrub up pretty good, Christina. You should wear the colour purple more often. A lovely pattern; I love the easy shape of it. Your cardie looks very comfy. Oh....love the beanie too. It is lovely - colour is great! A beautiful make, looks so warm and cosy and I love the colour. We are back to normal too weatherwise for which I am thankful, it will be nice to get and about a little more. (We are not keen on icy roads). Yes, another to add to the list. I do like the jumper pattern, both with the scoop and the cowl neckline. I agree with Kim purple does look good with your colouring, I may be biased though as the last 2 jumpers that I have knitted are purple. There is a good chance the the next one will be lilac. Love it, what a.wonderful color. Purple suits you. I think that jumper with look great.. I love the front pattern. 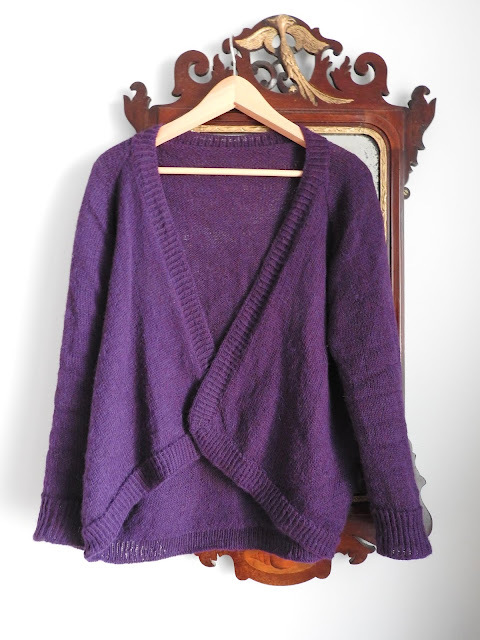 I think you look fabulous in your lovely purple sweater! Like my mum before me, I'm a big fan of the cardi and yours looks fab. The style and colour really suit you. And it's a yes from me re the sweater pattern. You look wonderful Christina. Cardigans are so useful. I love the color. I love your unusual cardi. Colour suits you well. Why not make a cardi with the pink wool ? Then it will be ready to wear for summer. If its hot like last year you may not get wear a jumper. Wow this is amazing! The amount of time that went into it makes it all the more special. What an interesting construction, it looks lovely on and the colour really suits you. I've got a cardigan on the needles at the moment which I can't seem to get motivated over, I'm using Drops Nepal. I really like the Drops range, very affordable and it holds up well. It looks lovely... as do you! Gorgeous colour too. Nice go see you wearing my favorite color, Christina, and the cardigan looks lovely. And, I also like your cap. I love the colour. It looks great. I love it! It is a perfect pattern, just enough flare and fun to make it interesting, but not enough stuff to make it a complex knit. As for those little needles, bless you, they are so hard to use and it seems you knit forever and make no progress at all. You look fab!